Help CentreUsing SuperControl Managing housekeepingWhat does my housekeeper see when they login? 2. Click "Edit" next to your housekeeper. 3. Click Impersonate. This will allow you to impersonate your housekeeper login to see what they will see. 4. 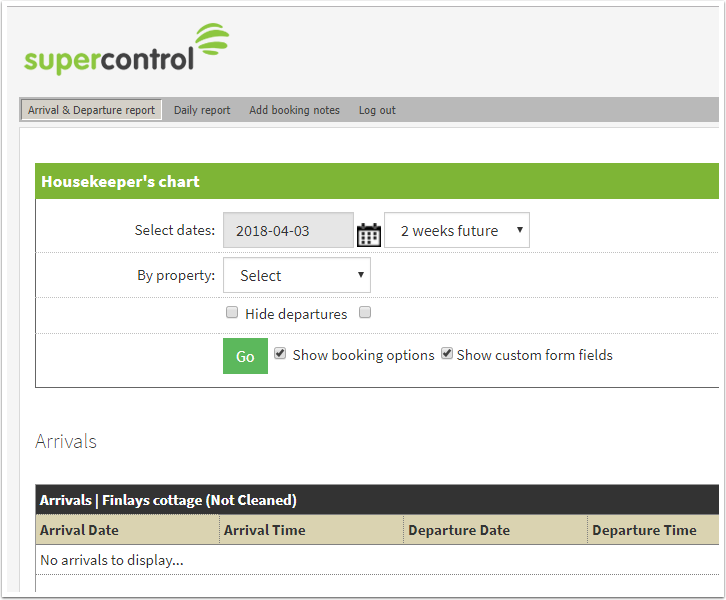 Your housekeeper will have a simple menu layout allowing them to view arrivals and departures. Arrivals & Departure report: A quick view report allowing you to view arrival and departures for a specific date range. Daily report: Allows you to view arrivals and departures with the option to export into a PDF. Add booking notes: Allows your housekeeper to add additional notes to a booking if needed. Prev: How do I send my housekeepers their log in details? Next: How do I email my housekeepers their arrivals and departures?